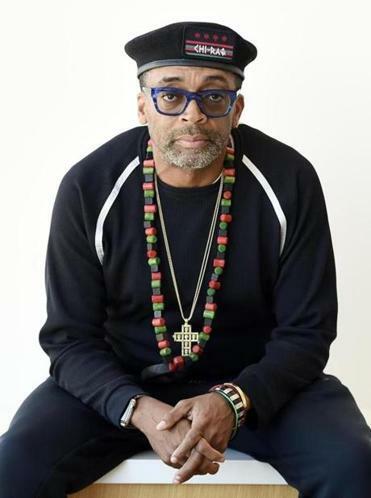 A number of roadblocks stood between Spike Lee’s home turf of Brooklyn and a creative new movie he wanted to shoot in Chicago. One was financial. His latest film, “Chi-raq” — an appropriately ribald adaptation of the Aristophanes play “Lysistrata,” set by Lee amid the violence of gangland Chicago and performed with a rhyming verse that appropriates the rhythms of rap music — is the first theatrical release funded by Amazon Studios. The reason? Every other studio rejected it years ago. Perhaps that’s because the director’s concerns are far removed from the Hollywood materialism of gold statues and big box office. But while the Academy looks back, Lee keeps his eye trained forward. He shot “Chi-raq” in a mad rush — production took place in June and July, with the final cut finished soon afterward — and was constantly rewriting to include references to contemporary victims of shootings and police brutality. He even made alterations in post-production to allow for references to the recent mass shooting in Charleston, S.C, and to Sandra Bland, an African-American woman who recently died while in the custody of police officers in Waller County, Texas. Not everyone’s happy about Lee’s ability to open doors. In the early stages of production, some of Chicago’s politicians made a concentrated effort to keep their city closed to the filmmaker. Take, for instance, Alderman Will Burns, of Chicago’s 4th Ward. He sponsored a bill to block state tax credits for production of “Chi-raq” by arguing that the film’s title — originally popularized by rap artists equating Chicago’s high homicide rate with the danger experienced by American armed forces abroad — would drive away tourism and potential businesses. That move may have earned Burns an analogue in the Spike Lee Cinematic Universe: We see campaign signs for the ostentatiously named Alderman Hemingway Hambone throughout the background of the film’s ecstatically garish compositions. Online, reaction to the film’s trailer was comparably swift and merciless. This being a Spike Lee film, the conceptual flourishes are upfront: Samuel L. Jackson as a one-man Greek Chorus who interrupts the narrative with sophisticated witticisms; interpretive dance sequences set at nightclubs and churches; characters who break the fourth wall while they state their respective case. As Lee tells it, his unreserved voice may have provoked the loud response — audiences thought he wasn’t treating the subject with the proper respect. So he’s taken to defining the word satire, and lamenting the culture’s inability to comprehend it. Actually, “satire” is a reductive phrase for describing “Chi-raq.” Lee lapses in and out of both the actor’s rhyming verse and his own humorous tone. John Cusack, playing a role influenced by Chicago-area priest and activist Michael Pfleger, delivers a scathing indictment of the area’s living conditions during an extended church-set sequence, identifying the Southside as a conveyor belt carrying African-American children from “third-rate schools into first-rate prisons.” Phrases like “silent co-conspirators” and “self-inflicted genocide” are spoken with righteous indignation. As a moment of cinematic activism, this is startlingly direct — even by the standards of an artist who often has his characters speak directly into the frame. And to any who might argue that the solution to Chicago’s gun problem involves harsher sentencing by the courts, Lee provides some pushback of his own. “I dispute that. They’re locking too many people up. People have been in jail for years because they couldn’t raise bail, or because they got caught with a joint. Those are mild charges. No guns connected to that. He’s careful to use the word “strategies” in his explanation. The alternate — “solution” — is one he bristles at. He’ll talk politics, but he contends that his films aren’t so simple as to search for solutions. If his cinema is going to save lives, he suggests, it’s not going to be by backing bureaucratic strategies. “Hope” is constant among the mantras that recur, visually and verbally, throughout Lee’s work. (“Wake up” and “Open your eyes,” two others, also appear emphatically within “Chi-raq.”) And the director testifies that he does have hope that the city will cure its ills — despite the increasing homicide rates, and despite the lax gun laws of Chicago’s neighboring states, which help perpetuate them. “Because I’m an optimist,” he says bluntly. But would he let his two teenage children walk to school if the Lee family lived on the Southside of Chicago? Jake Mulligan can be reached at jake.mulligan2@gmail.com.